While it is usually difficult to review edited volumes because of their diversity, this project presents a particular challenge to this reviewer. De-Westernizing Film Studies not only accommodates writings from diverse disciplinary fields, but also features interviews with several directors. 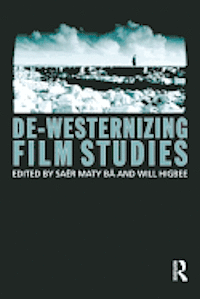 However, the editors, Saër Maty Bâ and Will Higbee, have done tremendous work in compiling a wide variety of essays and interviews into a single, coherent volume that concentrates on one theoretical task: determining the best way to de-Westernize the study of film. Put differently, in the words of Graeme Harper from the forward to the volume, the aim is to recover the discipline of Film Studies that has been “Westernized” by “a lack of attention to alternative possibilities” (XV). The volume is divided into four parts; the first two are composed of four essays each, the third has three essays, and the last contains no less than fourteen interviews with filmmakers engaged, to some degree, with “de-Westernization”. Whether each and every writer and filmmaker contributing to the volume conceives of the “West” along similar lines is questionable, but the editors do make sure that the goals for the volume as such are high. In their introduction, Bâ and Higbee propose a reflexive theoretical position that seeks to think beyond dichotomies of what they perceive as “Eurocentric binaries”, such as East/West and “Hollywood and the rest”. That is, “de-Westernizing” can be thought of as a “method for studying the balance of power in cinema as a global and local culture force” (13). The radical approach of this volume is exemplified by its inclusion of not just academic essays and interviews with filmmakers, but also essays by non-academics, such as the very first one, written by a musical duo, Edward George and Anna Piva, who are more commonly known as Flow Motion. Part one is subtitled: ‘(Dis-)Continuities of the cinematic imaginary: (non-)representation, discourse and theory.’ It begins with a fitting, unconventionally titled essay: ‘Imag(in)ing the universe: cosmos, otherness and cinema,’ contributed, as aforementioned, by the musical duo. Yet, Flow Motion does seem to follow a rather conventional mode of argumentation, although they promote a somewhat radical idea of a hybrid cinematic space through which convergence between experimental electronic music and film is made possible. The second essay, contributed by the editor Bâ, makes connections between discourses of black people and their diasporas with “thought” and “cinema” on the basis of their alleged refusal “to either be post-ideological or ignore the unconscious illusion”(36) of the “real” in the sense Slavoj Žižek has argued for. Bâ is also a co-author, with Kate E. Taylor-Jones, of the third essay in which they conduct an “affective reading” of dancing female bodies in two films, Zouzou (Allégret, 1934) and Karmen Geï (Ramaka, 2001), as a “free interpretation and challenge [to] the Western (and) patriarchal construction of the African-American/African ‘black’ female body” (53). For the “affective” component in their theoretical approach, the authors draw on works by many scholars, including, as expected, Gilles Deleuze’s work on cinema, but also Brian Massumi’s work on images and representations, Michael Hardt and Antonio Negri’s Empire, as well as the postcolonial work of Homi Bhabha. Finally, in the last essay of part one of the volume, Sheila J. Petty follows Okeke-Angulu toward an “alternative or opposing discourse from the non-Western worlds” (67) in looking at African cinema. Part two of the volume is devoted to issues bound up with nationality and specific geographical locations. In the first essay, the editor, Will Higbee, discusses the nation state and national cinema in North Africa as a framework within which to speculate about the concept of “de-Westernization.” He focuses on film director Ferid Boughedir and raises questions about the “purity” of the Western or non-Western nation state. He then moves on to propose, while referring to the work of Parth Chatterjee, an alternative to national cinema, one negotiated between both De-Westernized and Western fragments. In the following essay, Shahab Esfandiary offers a sober consideration of what is at stake when dealing with the notion of post nationalism in the study of film. He problematizes the broad conception of Iranian director Mohsen Makhmalbaf as a rebel filmmaker – a conception popularized by such scholars as Hamid Dabasi – and argues instead that the director adopts a Western point of view in certain moments, visible in the films: Kandahar (2001) and Scream of the Ants (2006). In the following essay, ‘Griots and talanoa speak: storytelling as theoretical frames in African and Pacific Island cinemas,’ Yifen T. Beus approaches de-Westernizing filmmaking “by highlighting modernized indigenous storytelling strategies”(111). She claims that African and Oceanian oral storytelling that find their way into films should not be viewed simply as “re-presentations”, since these do not have set versions, but rather as “a consistent sketch or outline of the same stories that are told in different part of the island or regions” (119). The next essay, the second contribution by Kate E. Taylor-Jones, is, surprisingly, the only one in the volume that deals with a film culture from the Far-Eastern hemisphere. The essay begins by paying attention to the WWII Japanese Imperial propaganda machine and its vision of a “Greater East Asian Film Sphere”. or that of “pan-Asian identity.” She then continues by speculating about contemporary multinational Asian conglomerates as a new vision of an intra-Eastern film sphere. Taylor-Jones mentions in particular two individuals as emblematic of such pan Asian efforts: actress Ri Koran and actor Takeshi Kaneshiro. The former is in fact Yoshiko Yamaguchi, a Japanese national who was born in occupied Manchuria and played Chinese female characters in several propaganda films. The latter is a Japanese/Taiwanese actor who appears in contemporary Chinese and Japanese speaking films. These are fascinating examples, yet it is regrettable that the essay does not deal with Yamaguchi’s Hollywoodian persona, as Shirley Yamaguchi. Moreover, though the essay acknowledges Kaneshiro’s origins through his father to the islands of Okinawa, it would have been more interesting if the author had discussed his intra-Japanese/regional identity as well. The third part of De-Westernizing Film Studies, ‘New (Dis-) Continuities from “within” the West’, contains three essays that could, perhaps, fit at the same time into both of the previous two parts, and thus enable a third category of de-Westernization. In the first of these essays, Nathan Abrams refers to director Stanley Kubrick and his Jewish origins. Abrams draws on the biblical exegesis known as midrash to think about Kubrick’s Jewishness which makes him both Western and non-Western at the same time. Similarly, Kathearina Lindner, in her essay, suggests a queer identity as another example of a complicated position within Western cinema. While analyzing two films, Girlfight (2000) and The Gymnast (2006), she admits that this cinematic position does not mean that “non-Western approaches are necessarily queer”, but it might lead one to speculate whether indeed queer films are necessarily an example of “de-Westernization”, particularly given that, by and large, queer cinema is a Western phenomenon. The last essay of the third part is perhaps the most daring one. In it, William Brown asks the question looming over the entire volume: does film really belong to the West? Brown’s methodology is unconventional as he brings together commonly oppositional approaches to Film Studies, so-called cognitivism and criticism based on continental intellectual thought. This theoretical acrobatics begins with David Bordwell’s sometimes disputed emphasis on the role of cognition in film viewing, and concludes with Hardt and Negri’s concept of “common”. Brown challenges the concept of “Western cinema” by arguing that individual films are not part of any cognitive singularity, but rather that they take part in a multitude that should be appreciated with “love” for an “alterity”, found in all films. As to the interviews, some readers will surely find a few if not all of them illuminating of practical aspects of de-Westernization, but I will not discuss them at length here. In conclusion, this is a provocative volume that provides new thinking about prevailing discourses in Film Studies. While one might be critical of the fact that the volume lacks a single working definition of what the “West”, or “Westernization” is, this lacuna is perhaps exactly what makes this volume flexible enough to welcomes the wide range of viewpoints that it does. One technical flaw is the index, which does not cover all the names and terms appearing in the essays. Some important writers and concepts such as Žižek and Hardt and Negri’s Empire, to name just a few, are mentioned several times throughout the volume but receive no indication in the index. A more acute weakness, however, is the lack of theoretical approaches from non-Western regions of the world, theories or ideas debated in non-Western languages. It is disappointing that the volume, albeit aspiring to offer alternatives to dominant discourses in Film Studies, presents no such theories.